Bauke Mollema (Trek-Segafredo) held everyone off all of the way to the line. I wasn't happy with the camera angles provided at the finish, so I waited for something better. 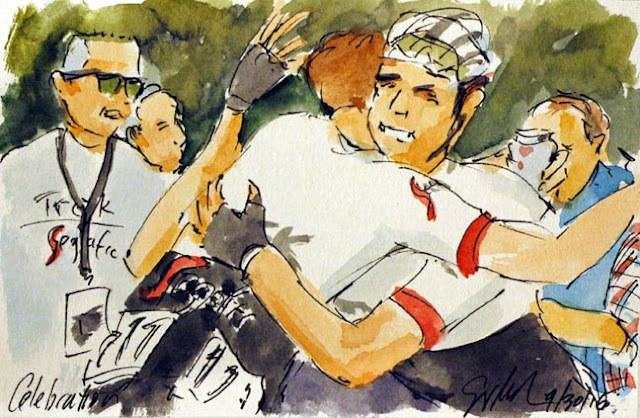 I felt that Mollema hugging one of his teammates once he got over the line as well, capture the joy of the Dutchman. 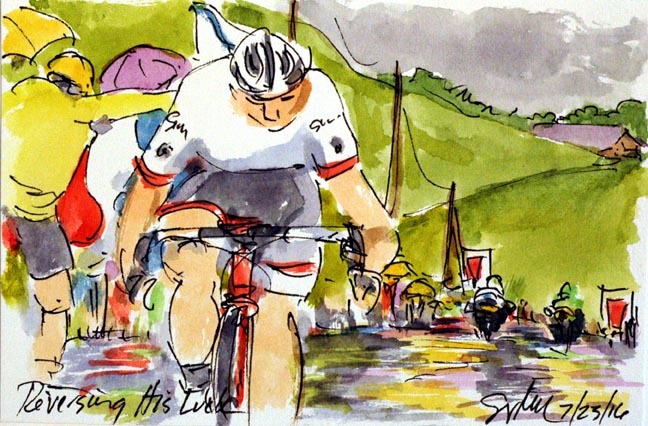 Mollema had been riding a great Tour de France, until the final luck when a combination of bad luck and a sore body that dropped him to eleventh overall. Chapeau! This is a small original watercolor and ink painting that was created using Yarka St. Petersburg watercolors and Steve Quiller brushes from Jack Richeson & Company. 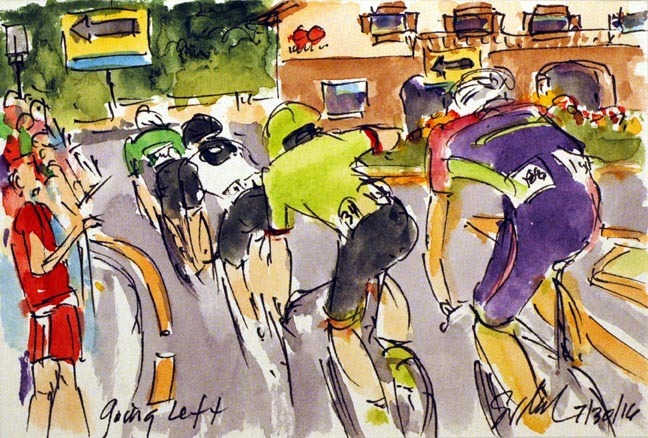 This painting, along with all of my cycling art, is available through my artist website at www.greigleach.com. 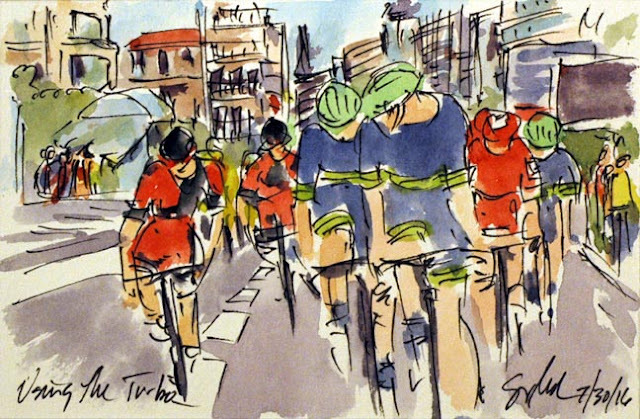 While you are on the site, be sure to check out my other works of art and my two cycling books. To purchase this particular painting, just follow the direct link at the end of this post. Bear in mind that this is a one of a kind original and once it is gone, it is gone. It was Bauke Mollema (Trek-Segafredo) who got to the top of Bordako Tontorra first. The Dutchman took a bag from Chris Froome's Tour de France, and went hard just as the others sat up for a moment. 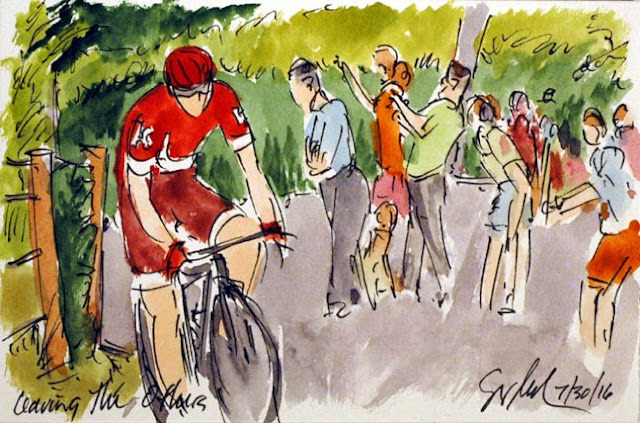 Mollema pushed out a small opening and hammered all of the way down the back side of the climb to town. The three chasing, Joaquim Rodriguez (Katusha), Greg Van Avermaet (BMC) and I can't remember the third, never saw Mollema again. The first attack on the Bordako Tontorra was launched by the leader (and former winner of this race), Adam Yates (Orica-BikeExchange). The first to respond to the Englishman's attack was the Spaniard on the Russian team of Katusha, Joaquim Rodriguez. Rodriguez bridged across and then went off on his own. He left all of them behind as he neared the summit of the climb, could he reach the top still off the front? With the finish line just seven kilometers from the top, it would be a fast dangerous ride down to the line in San Sebastian. 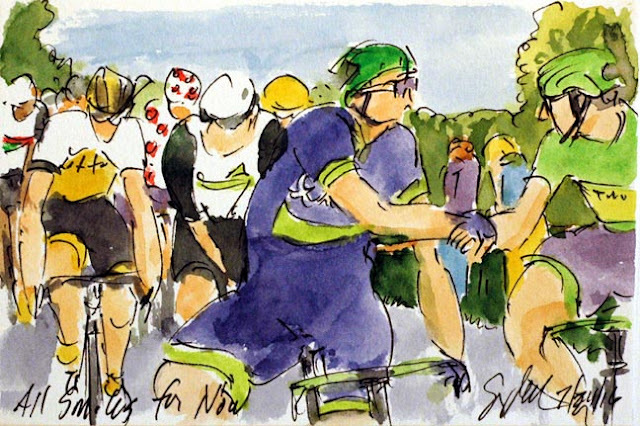 Luke Durbridge (Orica-BikeExchange) hit the final climb up the Bordako Tontorra, pulling hard for his man, Adam Yates. The race organizers have a group of motorcycle riding officials who stop along the way and warn riders of potential dangers along the route. Sometimes the motorcycles them selves are the danger, but not today. The peloton took a quick ride through the finishing town of San Sebastian (or Donostia) before heading back out for the final climb in the race. The young star from the Tour de France, Adam Yates (Orica-BikeExchange) is the defending champion, and his team was eager to have him repeat. Orica-BikeExchange put the powerhouse, Luke Durbridge, on the front, follow closely by Christopher Juul Jensen. Waiting in the wings are the domestiques of BMC and Katusha, ready to bring their team leaders to the business end of the race. With the peloton approaching just 20 kilometers to go, riders were dropping back to their team cars to grab water bottles and gels. Once there is less than 20 k to race, riders can no longer get any thing to eat from their team cars. Mikel Nieve (Sky) was the man on the team to go back to the car. He may have not only been collecting water for the team, he probably collect some information of the final climb as well. It is less usual to see a rider with a bib number that end in a 1 being the one to go to the team car. 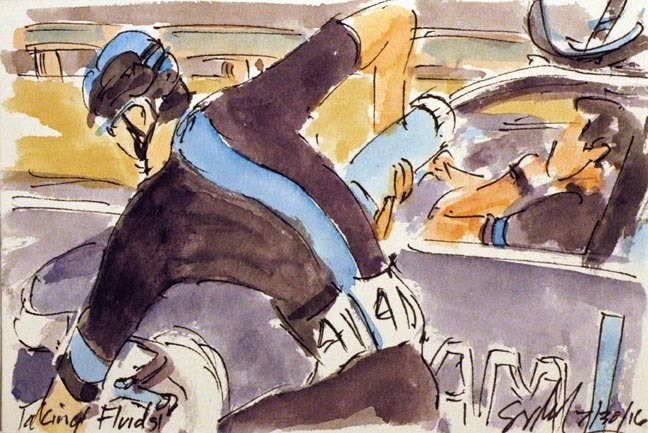 His #41 designates him as the team leader of Team Sky. The champion of Luxembourg, Bob Jungels (Etixx-Quickstep) drop back through the race caravan looking for his team car. I never did find out whether he had a problem on the climb up the Arkale, or was just headed back in search of water bottles for his teammates. Later he could be seen back near the front of the peloton on the other side of this climb. Movistar hit the front to toughen up the race and place Alejandro Valverde into position for the second trip up the Arkale. Tucked onto the Spanish team's wheel were Cannondale-Drapac and Team Sky. The pace they were pushing was drawing the peloton out into a long thin line as each rider struggled to hold onto the wheel in front. After several groups escaped and were pulled back, this foursome managed to stay off the front towards the end of the race. Four teams were represented in the group as the rode through downtown Lezo as they prepared to go up Arakale. On the tail of the group was Premyslaw Niemiec (Lampre-Merida), Moreno Moser (Cannondale-Drapac), Jacques Janse Van Rensburg (Dimension Data) and Jamie Roson (Caja Rural-Seguros). 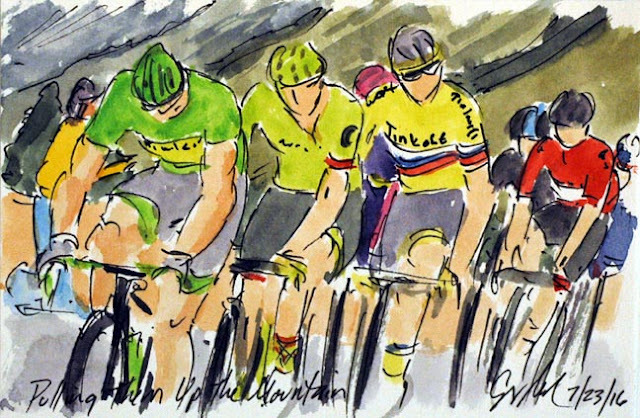 Be sure to check out my second cycling art book, Art of Cycling: Richmond 2015 UCI Road World Championships, available online or through your local book seller. 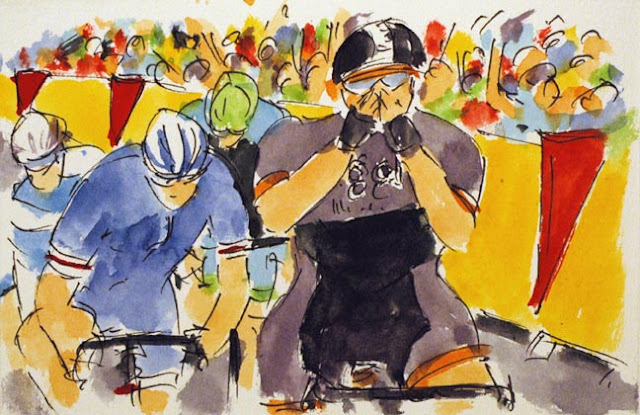 As Chloe Hosking (Wiggle High 5) crossed the line, she held her hands to her face in disbelieve. She had chased down the fleeing Eleonora Van Dijk (Boels Dolmans) with less than a kilometer to go. 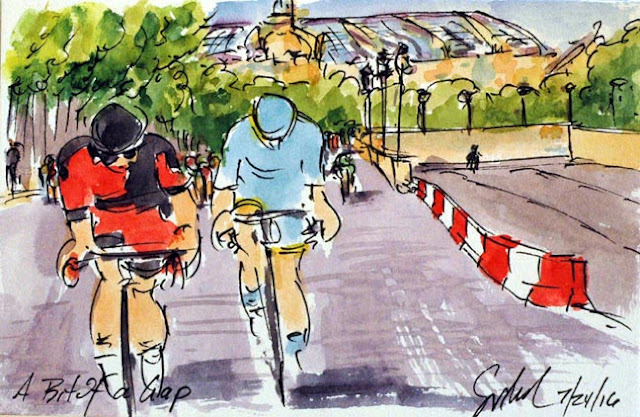 She starter her sprint just after rounding the last corner around the Place de la Concorde, under the shadow of Joan d'Arc. She was able to hold off the fast closing Marianne Vos (Rabo Liv) who is the defending champion from last year's rather rain soaked event. She did well to survive the late crashes that took out some of the bigger names in the sport, and held others or their lead out trains behind. Coming in second was Lotto Lepisto (Cervelo Bigla). Others in this painting include Roxane Fournier (Poitou-Charentes Futuroscope 86) and Joanne Kiesanowski (Tibco Silicon Valley). Hoping to be able to rely on her time trial skills, Eleonora Van Dijk (Boels Dolmans) went off the front of the peloton with just 2 kilometers left to ride. She was still holding everyone off as she went under the flame rouge showing the riders that their was only one kilometer left to race. It was looking like the Dutch girl had made the winning move as she road by the gardens outside of the Louvre. Laura Stephens (Tibco Silicon Valley) looked into the eyes of Lucinda Brand (Rabo Liv) trying to determine if she had anything left. The two were joined in the next break by Amy Pieters (Wiggle High 5). With just eight kilometers left to go, they were in with a real chance. In less than a kilometer they would hear the welcome sound of the bell signifying one lap to go. As the race has gone on the crowds have grown by leaps and bounds. As I said, as soon as one group was caught, another went. Now it is Danielle King (Wiggle High5) looking over her shoulder. She is both checking on her progress and trying to convince her companion riding for LIV-Plantur to come around to take a pull. The woman behind the rider on the front will use thirty percent less energy than the one on the front. Given the effort, King was trying to get a little help pushing through the wind. Both were riding in the gutter up against the barriers trying to find the smoothest course up the Champs Elysees. With the first break away back in the fold, several more attempts were made to get of the front. Every time they were pulled back, just to see another group try again. Riding in the Capital of her homeland, Audrey Cordon (Wiggle High5) felt she would be the one to get away. She was joined by riders from UnitedHealthcare and Orica-AIS. I am sorry that I wasn't able to discover these riders names. I really do want to name everyone who gets out and competes in the professional peloton. Prior to the men arrive for the final sprint of the Tour de France, it was the women's turn to race on the cobbled boulevard between the Louvre and the l'Arc du Triomphe. 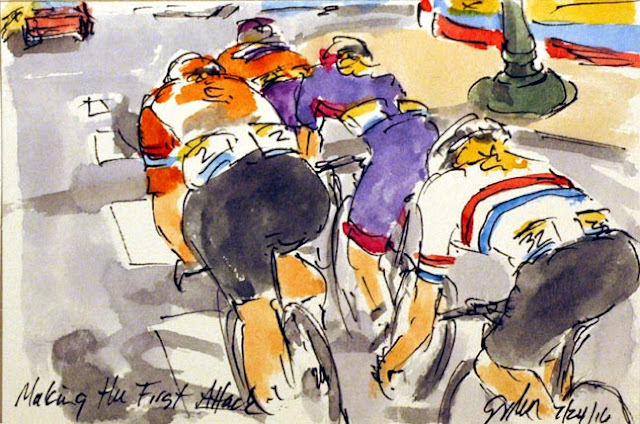 The constant jarring of the cobbles can be very fatiguing so the women are all trying to ride in the gutter, the only section of some pavement to be found. The gutter brings the risk of flat tires or worse. I have once clipped a curb with my pedal sending me sprawling on the ground. Later in the race, there were some crashes where at least one time, the curb was the cause for these hard women, too. Riding on the back for now is the American, Alison Tetrick (Cylance Pro Cycling). Joining her were riders from ALE Cipolini and Boels Dolmans. I have become a fan of Cylance ever since they added Kathryn Bertine to their roster. Just to tie it into a nice little bow, she was part of the group that help to make La Course happen. It was a power foursome that were to get off the front of the third annual La Course. La Course is a Pro Tour Women's race contested on the finishing circuit of the final stage of the Tour de France. It was the newly minted British National Champion, Hannah Barnes (Canyon SRAM), who was joined by Lucinda Brand (Rabo Liv), Olga Zabelinskaya (BePink) and Chantal Blaak (Boels Dolmans). The women used the downhill section of the Champs Elysees to open up a bit of a gap on those behind. It was rather early in the race, so it was unlikely that they would be able to stay away for the rest of the day. Andre Greipel (Lotto Soudal) has won at least one stage in the previous five Tours de France. 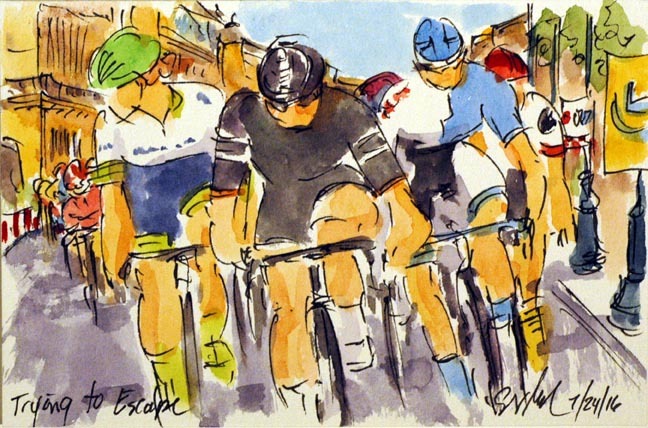 At the start of the day, he had yet to cross the line first in any of the prior twenty stages in this edition of the Grand Boucle. As the German National Champion crossed the line he looked to his right, just making sure that the fast closing Maillot Vert of Peter Sagan (Tinkoff) didn't beat him with his highly effective bike throw to the line. At least this time he did not. The sprint for the final stage victory was opened up by the Norwegian sprinter, Alexander Kristoff (Katusha), but he was no match for the "Gorilla." 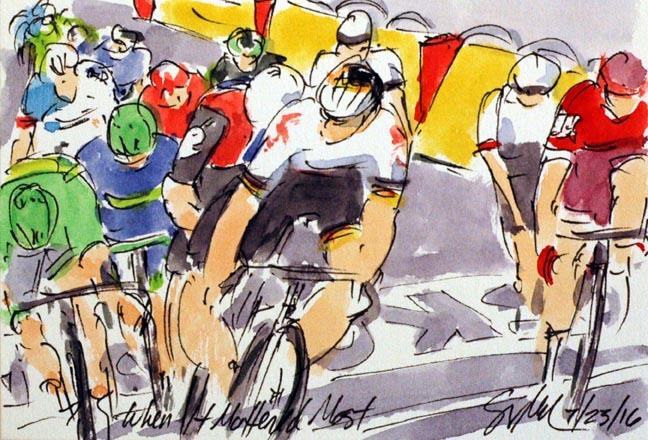 Perhaps if the line had been another 100 meters, Sagan would have gotten around the powerful German sprinter. The other Norwegian sprinting for the line was the national champion, Edvald Boasson Hagen (Dimension Data) who crossed the line in fourth place. Sprint duties for his South African team fell to Boasson Hagen since the very successful Mark Cavendish left the Tour before the Alps to prepare for the Summer Olympics. Rounding out the top five was Michael "Bling" Matthews (Orica-BikeExchange). It is a nice fitting end to my day's paintings since the pair had shook hands prior to the end of the neutral start seventy kilometers ago. This is the last of my Tour paintings for this year. 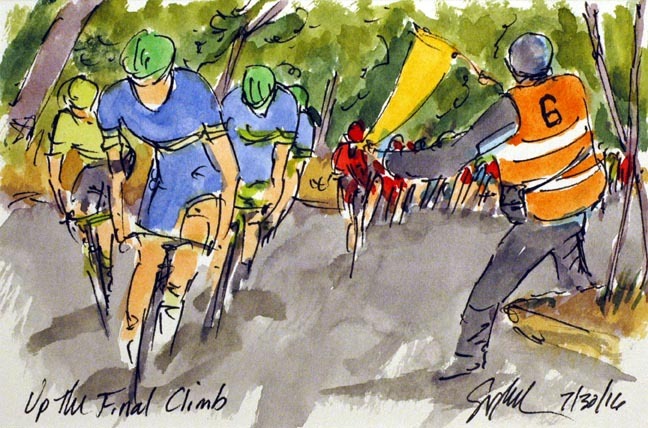 I am currently painting La Course and will post those in the next couple of hours. Following that, I will take a bit of a break before capturing the Summer Olympics in Rio in about two weeks time. 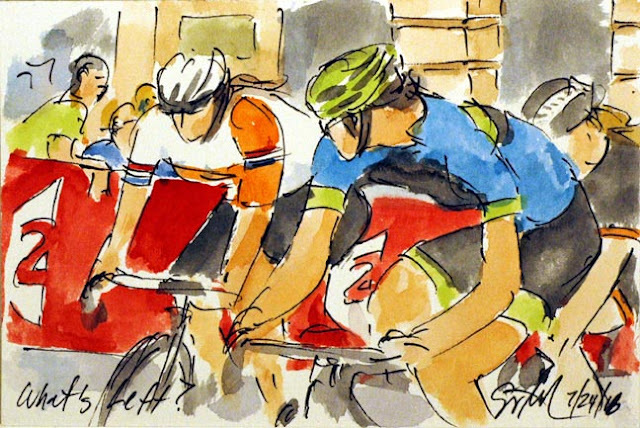 I will be painting the lion share of the sporting events, not just focusing on cycling. I hope you will check back for the "Art of the Olympics"
Tour, Final Stage: Is There No Justice? Bryan Coquard (Direct Energie) was the second of the marquee sprinters to suffer a flat tire. However unlike Marcel Kittel (Etixx-Quickstep), Coquard had the misfortune to have his mechanical on the bell lap. As he pulled off looking for his team car, he knew that his dream of taking out the final stage of the 2016 Tour de France, was further away than the l'Arc du Triomphe. It was going to be impossible to catch back on even if he already had gotten back underway. It seem cruelly unjust to have the French sprinter and best hope for a French win on the Champs Elysees to be unable to sprint for victory. As it usually goes on the Champs Elysees, as soon as one escape was brought back to the peloton another one goes. First to go off on his own was Alexey Lutsenko (Astana) not the first time in the Tour he has left the peloton behind. Greg Van Avermaet (BMC) road across the gap to join forces with the Kazakhstan and together the pair built on their advantage over the peloton. While I have enjoyed all the vistas that have played across my television screen during the Tour, I am always thrilled to see Paris a city I have visited five times since I was a teenager. I admit, I would much rather be walking the streets now than sitting in Richmond, Virginia. My love of bike racing started when I purchase my first cycling magazine in Paris, Eddy Merckx was on the cover. Tour, Final Stage: Not Happy! Marcel Kittel (Etixx-Quickstep) was not remotely pleased. He had a flat, which is to be expected on cobbled city streets. His mechanic gave him a super quick bike exchange (faster then changing the rear wheel), so all was good. That is until, Kittel jumped onto the new ride and discovered that the rear tire was flat. He was justifiably pissed off. I have never seen that one happen before. Kittel pulled off his own wheel partially to aid his mechanic and partially so he could throw it to vent his frustration. He threw it towards the curb, but it took an odd bounce into the passing caravan. However after hitting another team car it came rolling back to his mechanic's feet. After a new wheel, he then had gearing problems with the chain. That one he took care of himself. There was plenty of time to get back into the peloton, but at what cost of energy? Etixx-Quickstep already had the withdrawal of Tony Martin in the middle of the final stage, so it was clearly not going their way. As soon as I saw the American, Lawson Craddock (Cannondale-Drapac) go into the first serious break away on the Champs, I knew what the title would be. Now I just had to find the right image to go with it. For those who aren't aware, Gene Kelly, did a wonderful film shot in the 50's about an artist who moved to Paris to follow his dream. Craddock is following his dream. 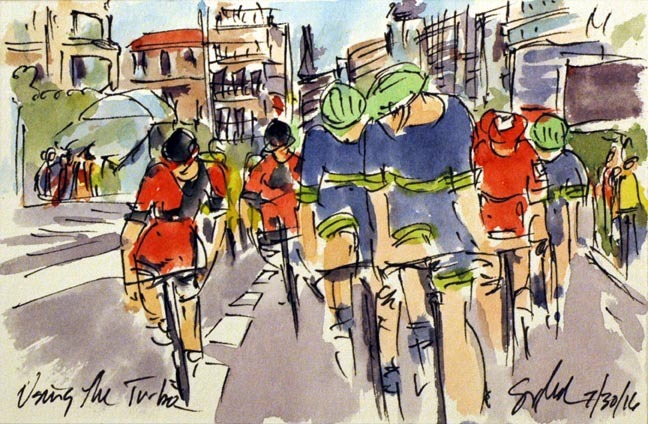 Every bike racer no matter how amateur dreams of racing on the cobbled boulevard of Paris, I know I did. Craddock actually got to see that dream come true, and he certainly make sure his family saw him (along with every American cycling fan watching at home). Joining Craddock was Marcus Burghardt (BMC), Daniel Teklehaimanet (Dimension Data), Brice Feillu (Fortuneo Vital Concept) and Rui Costa (Lampre-Merida). The other rider who is hidden right now is Jeremy Roy (FDJ). The group stretched their lead out to almost thirty seconds before the sprinters' teams decided to shut it down. 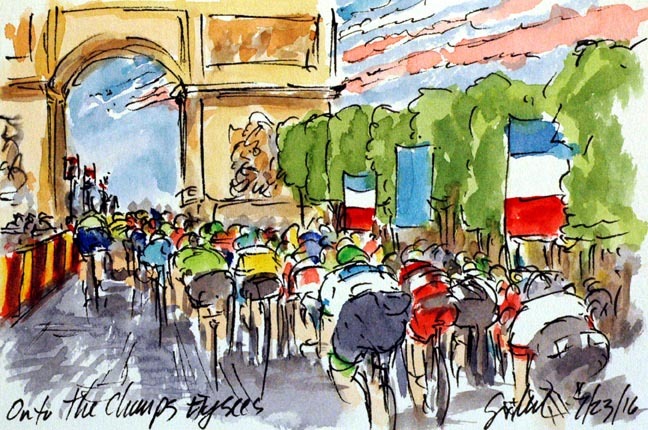 After thousands of kilometers, days of wind and rain, countless climbs, road rash, mental and physical exhaustion, crazed fans, aggressive press crews and millions of pedal strokes, the peloton finally swung on to the fabled Champs Elysees and headed up to the l'Arc du Triomphe. I know I had goose bumps as the jets flew over head trailing the colors of the French flag, I do not doubt that every one in the race felt the same. The air force timed it to perfection flying over the peloton just as they crossed what will be the finish line in just eight laps. 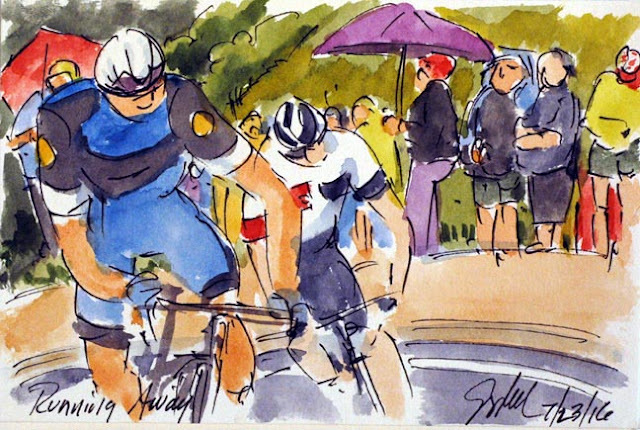 As Team Sky lead the race onto the course, it was now time for the days racing to begin. It was nice to see that Sky and the peloton gave Joaquim Rodriguez (Katusha) a chance to lead everyone on to the Champs for his last race across these cobbles. Tucked onto the back of the peloton is the Maillot Blanc of Adam Yates (Orica-BikeExchange). He may have missed the podium by a few seconds but he does go out with the title of Best Young Rider. I'm looking forward to watching him over the coming seasons. As I said in the previous post, I have worked in theatre off and on for years. One of the traditions for the theatrical crews is "beer thirty" and as a designer I have supplied the beer to the crew that made me look good, that made me succeed. 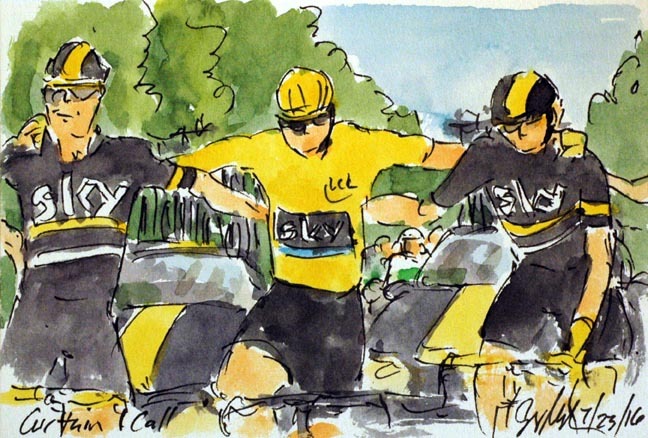 I was delighted to see that Chris Froome (Sky) omitted the traditional champagne, and pass bottles of beer around to his "crew" who without them he would not be wearing the Maillot Jaune. By toasting the team with beer Froome underscored that he raced this Tour in an unpredictable manner gaining the Yellow Jersey by doing the unexpected. As an artist I have worked in quite a few different creative disciplines, one of which was theatre. I have worked as both a scenic artist and a set designer. So, this photo op is a familiar activity to me. I call it the 'curtain call' when all of the actors come out on stage, lock arms and take a bow to the audience. This is exactly what Chris Froome (Sky) and his supporting cast of riders was doing for the camera and for us. Well done, Froomie and all of the Sky boys. This is the fifth Tour that Team Sky has one, they now have it down. The team changes their team cars, team kit, an apparently their cell phones, replacing all of the usually blue accents with bright yellow ones. The final stage of the Tour de France is a tale of two races. The first part of the race is time to celebrate making it all of the way around France, a chance to chat with friends, congratulate the jersey winners and goof about just a bit. The second is the flat out racing to when on the Champs Elysees, To get that victory for the team, that may not have happened yet, or for a sprinter to get the win that has yet to go his way. Here, Michael Matthews (Orica-BikeExchange) shakes hands with Peter Sagan (Tinkoff) on the Champs Elysees they will be going as hard as they can to beat one another to the line. Surprising everyone who had already attacked on the Col de Joux Plane, Ion Izaguirre (Movistar) gave everyone a lesson on how to go down a mountain in the rain. Izaquirre went on to take the victory in Morine Avoriaz over four minutes ahead of the yellow jersey group and nineteen seconds ahead of the Colombian, Jarlinson Pantano (IAM Cycling). Izaguirre makes it a win for Spain and claims the stage that his team leader, Nairo Quintana, has been unable to deliver. 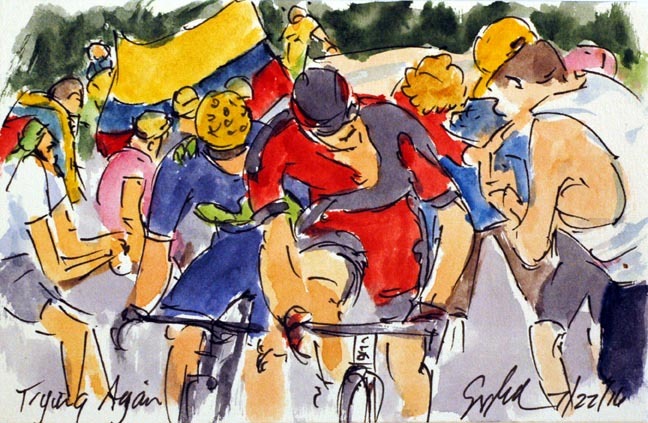 Now he can take home a stage victory in the Tour for the family, his brother, Gorka, crashed out of the Tour in stage 17. Pantano now has one stage win and two second places in this Tour giving the scores of Colombian fans something to cheer about. 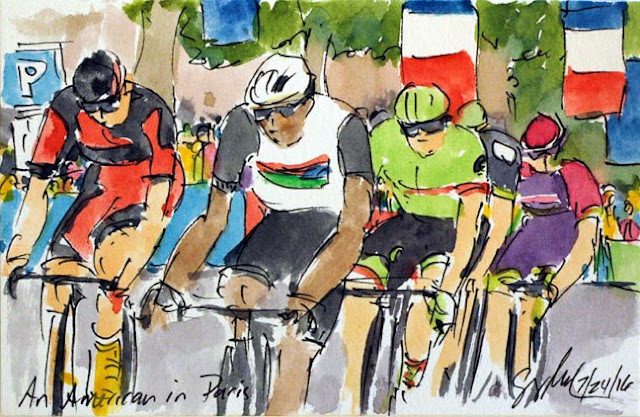 Today was the final day of real racing in the 103rd Tour de France. 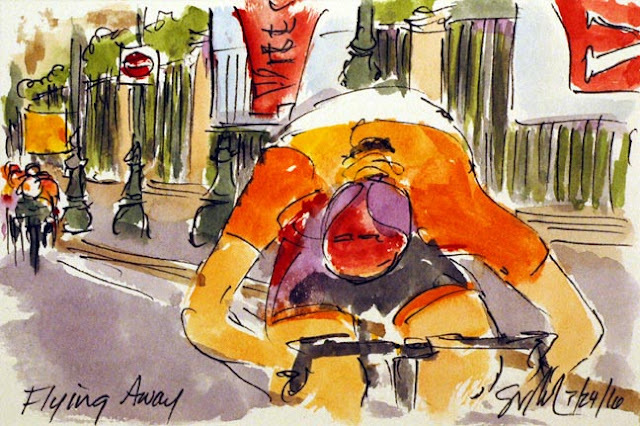 Tomorrow the peloton will coast into Paris, provide a celebratory lab to the Yellow Jersey and his team, and then the sprinters and opportunists will vie for stage victory in the shadow of the l'Arc du Triomphe. Early in the day the women's professional peloton will race on the Champs Elysees in the fourth edition of La Course. 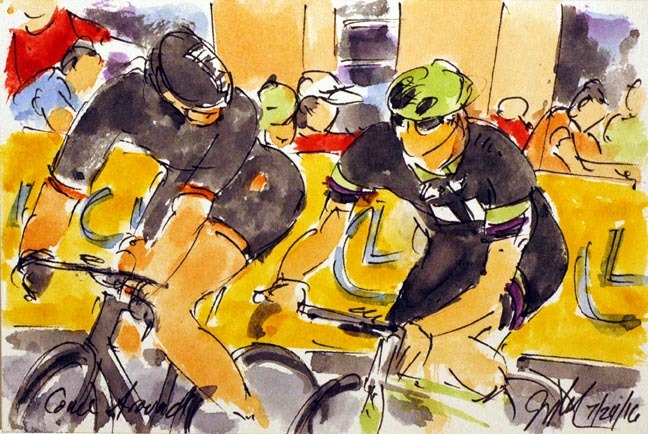 I will be painting that race as well. Look for both the last stage of the Tour and La Course here sometime in the next 36 hours. It has been reported that Joaquim Rodriguez (Katusha) his hanging up his cleats at the end of this season. 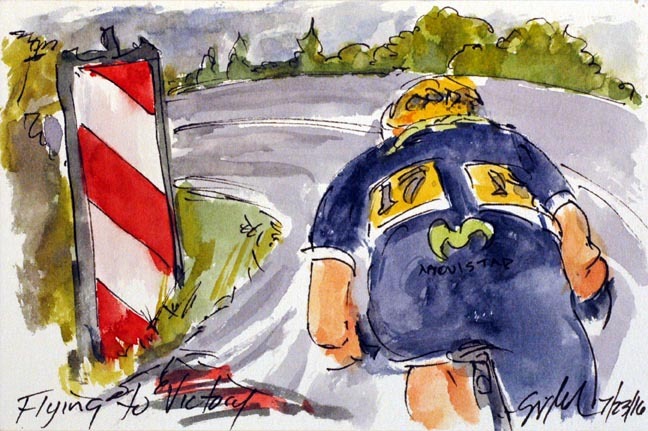 If that is the case, than this is him cresting his last alpine pass in the Tour de France. Not wanting to go out with a whimper, Purito jumped from the Yellow Jersey group and went on the offensive along with his teammate, Ilnur Zakarin. It was a long shot thinking that they could catch those up the road, the leaders were two and a half minutes and there is only eleven kilometer (downhill) to the finish. Still, nothing ventured, nothing gained. Perhaps he could go down the wet roads faster than anyone ahead or behind. Julian Alaphilippe (Etixx-Quickstep) and Jarlinson Pantano (IAM Cycling) had pressed on their advantage from the descent of the Col de la Ramez. 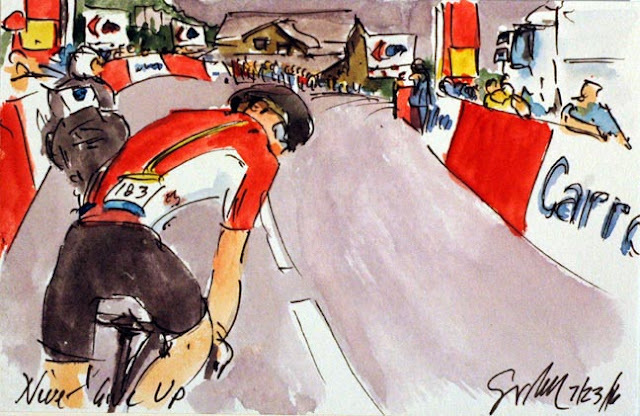 The duo reached the base of the final climb of the Tour first, but they were not the only ones to see the Col de Joux Plane as the place to launch and attack. Earlier Bauke Mollema (Trek-Segafredo) had gone on the offensive, to no avail. However the winner of this year's Giro d'Italia, Vincenzo Nibali (Astana), saw this as a great opportunity as well. His team leader, Fabio Aru, had already cracked and was dropping of the Yellow Jersey group. That left the man nicknamed the "Shark" free to fly. The former Italian Champion bridged across to the pair of Alaphilippe and Pantano, but quickly left them behind after making the catch. Now to you get the title? Bauke Mollema (Trek-Segafredo) had a rather rough second day in the Alps losing his hard won second place overall. Mollema missed a turn on the final descent of the day, and then when trying to make up the lost time, he went down on a corner. With the lost time from the incidents and the pain from the fall, he lost minutes on the others who had been behind him at the start of the day. Feeling better although still trying to make up lost time, he attacked on the soggy roads of the Col de Joux Plane. While the reflections on the water logged roads where rather pretty, I am sure Mollema and everyone else would have preferred boring dry roads instead. The rain did nothing to reduce the enthusiasm of the fans along the side of the road. After a hair raising descent of the Col de la Ramez, the duo of Julian Alaphilippe (Etixx-Quickstep) and Jarlinson Pantano (IAM Cycling) rain across the wet valley floor. The pair made it around the sharp corner onto the main road through the valley and as the rather sodden fans watched the equally soaked riders whiz past. Those on the side of the road may be drier, umbrellas don't work well when you are trying to be aerodynamic. Pantano already has a stage win and a second place in this Tour, fast becoming the new darling of Colombian cycling, I believe he was hoping to strike again. Alaphilippe seems to becoming back into form after a rough mid-Tour. I am sure he would like to be the second Frenchman to win a stage. He did spend a couple of days in the Maillot Blanc of best young rider, but now he is over an hour off of the pace. The reason I picked this image to paint was primarily for the aesthetics. I was intrigued by all of the variations of green. That and it was also a great illustration of what it is to pay your team back for their hard work. It was a rare sight to see the Maillot Vert on the front of a break away that was climbing a second categorized climb of the day. Sagan was pulling the breakaway further away from the peloton behind. The plan was to help his teammate, Romain Kreuziger, climb up the general classification. I must apologize for getting the colors of the Czech flag out of order. It should be White, Red, Blue. 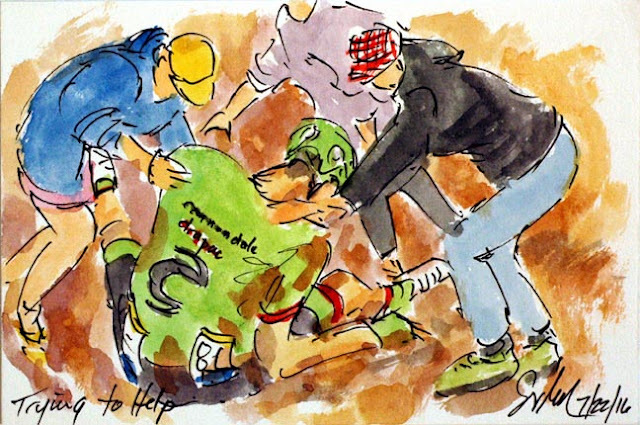 Inbetween the Tinkoff riders is Pierre Rolland (Cannondale-Drapac) who had the rather spectacular crash yesterday. As a testimony to his toughness, he finished the stage yesterday, and came out to the start today. In case their was any doubt, he confirmed it by getting into the break today. Following this trio are Thomas De Gendt (Lotto Soudal) and Sergio Henao (Team Sky). 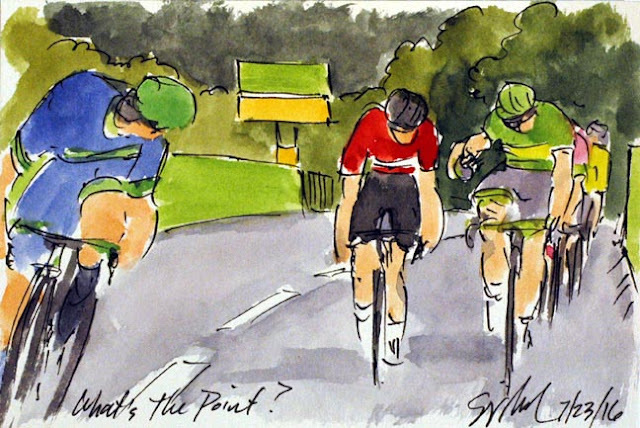 Tour, Stage 20, What's the Point? Peter Sagan (Tinkoff) went in the early break and was the first to arrive at the intermediate sprint. As the break arrived at the 500 m to go, Michael Matthews (Orica-BikeExchange) jumped out in a full gas sprint. Matthews looked behind to see if he would beat the Maillot Vert to the line, only to see him chatting with Thomas De Gendt (Lotto Soudal). Sagan has the Points Competition in hand so there was no real point in sprinting out for maximum points when he could take second place and have almost the same extra points without the extra effort. Sagan has now set a record points total for the third consecutive time in the Tour de France. It is possible that Sagan is in the break for another reason. Either he is riding for his teammate Romain Kreuziger, or he is training for the Rio Olympics. It is reported that he will be competing in the mountain bike races and leaving his road bike at home. Yesterday, Rafal Majka (Tinkoff) ensured that the Maillot a Pois was his, but there is always a chance that something could go wrong. Bearing that in mind, Thomas De Gendt (Lotto Soudal) was the guy who launched the break away with the intention of claiming as many points in the King of the Mountain competition as possible. Plus each jersey comes with cash prized for the top three finishers, so making sure he was second, was good for the spirit and the pocketbook. So it was that he jumped free of his break away companions and went over the top of the Col des Aravis. 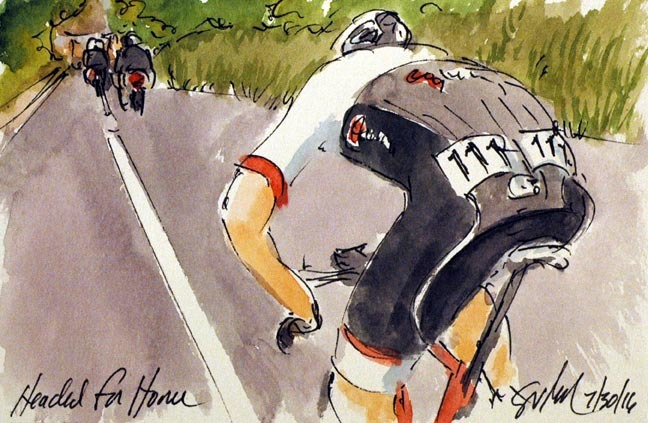 De Gendt went on to go first over the top of first three climbs on the day. Once done, he knew that his second place was safe. 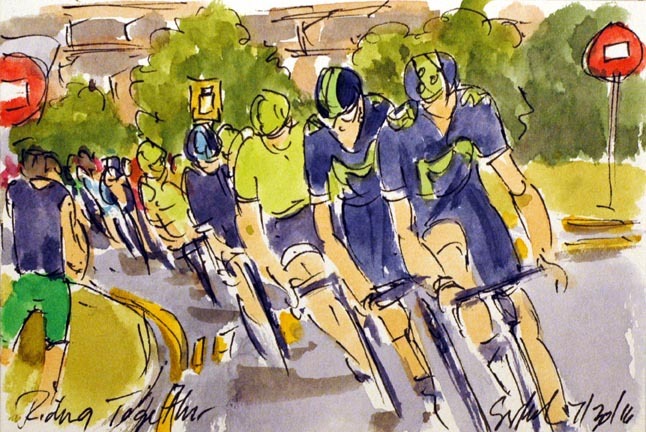 The winner of every stage faces a scrum of soigneurs, race personnel, press, interviewers and TV camera. The scrum goes ballistic when the winner is a Frenchman taking a stage for his country with only three stages left to race. 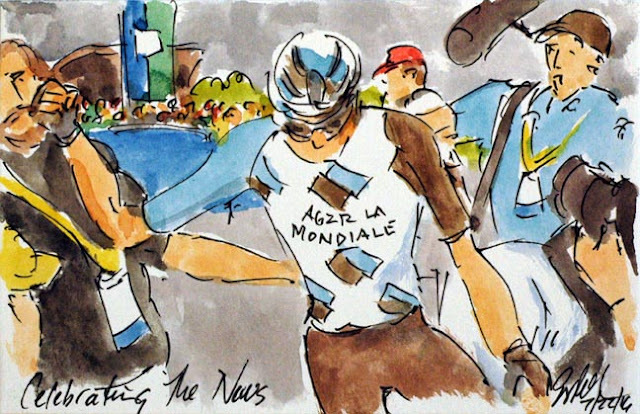 Romain Bardet (Ag2r La Mondiale) knew he had delivered the stage for France, but he along with his team personnel and the French press were waiting to see just how far up the General Classification he had managed to get. Bardet pumped his fist as they all learned that with his bonus seconds for the win, he is now in second place! 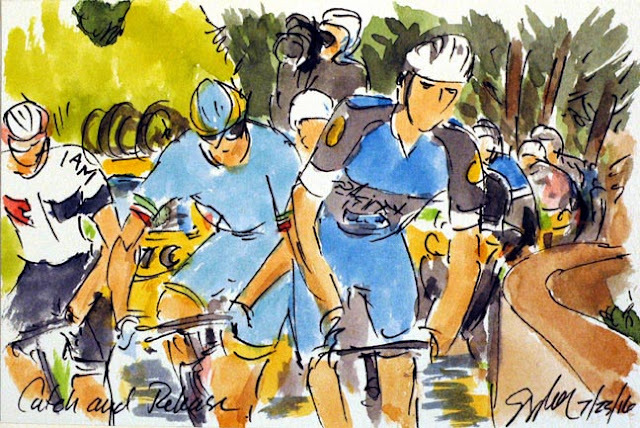 Although he is over four minutes behind the Maillot Jaune of Chris Froome (Sky). And yes he is pumping his fist in the air, not punching the personnel who is holding his arms wide. He is keeping a very close eye on Bardet, who he will shortly take to the doping control tent. Every stage winner is tested to make sure his win was clean. With one stage where the race will be full on, it is doubtful that Bardet will be able to take over the lead. But, Froome did crash, it will remain to be seen if there are any linger affects on his form in the final day in the French Alps. The last day it is considered bad form to attack the jerseys. 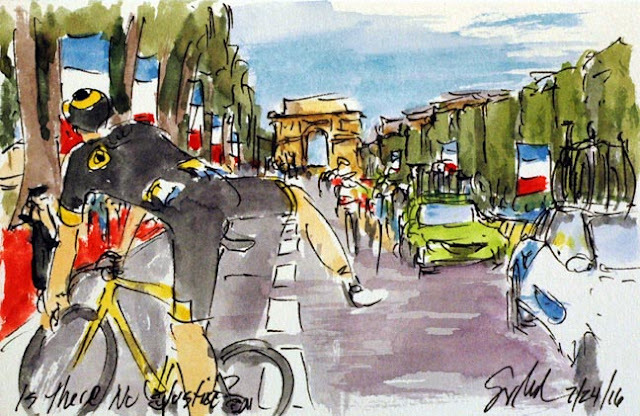 It is a day for a promenade, until the sprinters take over racing for a stage victory on the Champs Elysees in the shadow of the l'Arc du Triomphe. This title sums up the nineteenth stage of this Tour. Many had crashed once the rains came down. 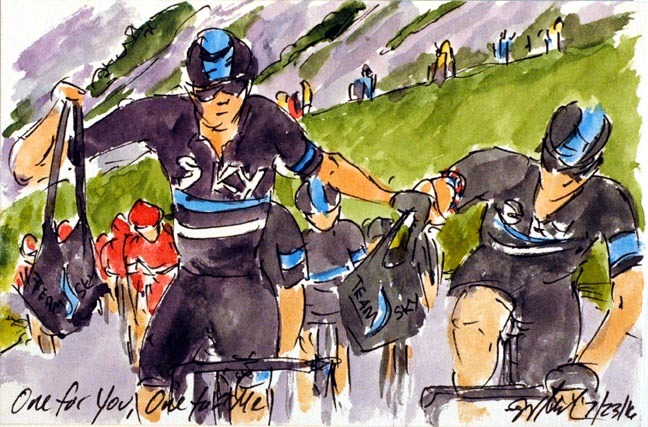 Amongst those to leave some lycra and skin on the alpine roads was the Maillot Jaune of Chris Froome (Sky). Due to Team Sky's planning for every scenario, Froome was surrounded by his teammates. One of whom, Geraint Thomas, happens to have a bike that fits Froome rather well. Certainly much better than the one he got from neutral service on the climb of Mont Ventoux. With Bardet up the road, everyone was racing hard leaving Froome no chance to trade back to his own steed. Like sharks, the rest of the peloton was sensing blood in the water, almost literally given how wet the roads were. 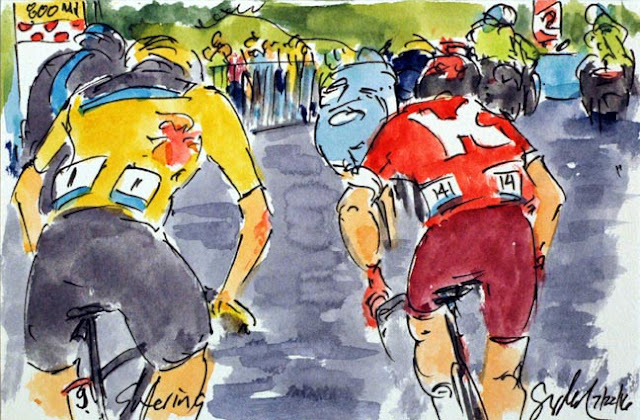 For the first time since he pulled on the Maillot Jaune, Froome was losing time to his rivals. But never one to panic, he reeled his biggest fear, Richie Porte (BMC) back in, but most of the others were able to pull back some time. Froome was tended to by his faithful teammate, Wouter Poels the whole way up the climb. 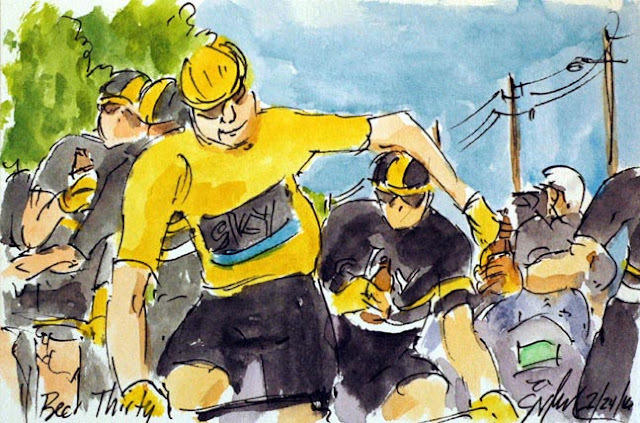 As the pair crossed the line, Froome first act was to reach out, pat Poels on the back in thanks for all of his work. Riding away from the Yellow Jersey are Fabio Aru (Astana), Joaquim Rodriguez (Katusha) and several others. One the day, the big loser was Bauke Mollema (Trek-Segafredo), and losing time to his rival for the Maillot Blanc was Adam Yates (Orica-BikeExchange). Although neither Froome nor Yates lost their jersey in the end. Richie Porte (BMC) had been the only GC contender to be able to put attacks into his former teammate, Chris Froome (Team Sky). He had gone early on the final climb of the day and been pulled back by the powerful Sky train. Put knowing that Froome had been one of those to crash before the base of the climb, Porte felt he could get some distance. Plus he had started the day thinking he could pull back the three seconds from Romain Bardet (Ag2r La Mondiale), however, Bardet was leading everyone up the road. At long last, Nairo Quintana (Movistar) found the legs to put in an attack of his own. The Colombian was also riding in fear of the Frenchman up the road. His countrymen along the course were going wild to see their man on the offensive. Tour, Stage 19: "I'm Not Happy to See You"
Rui Costa (Lampre-Merida) had taken most of the descent off of the Montee de Bisanne, gone across the valley and started up Mont Blanc all on his own. He must have been feeling like the stage would be his. At least until Romain Bardet (Ag2r La Mondiale) showed up on his wheel. Costa looked back over his shoulder seemingly saying, "I am not happy to see you." Bardet had started the day sitting fifth overall, but he wanted more. Plus, the French had yet to take a stage in their home Tour and there aren't to many more days to make that happen. 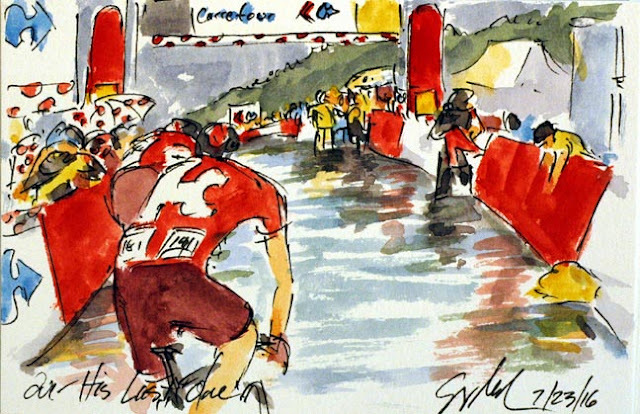 Bardet got a little help due to the carnage of crashes from the wet high speed descents. Just like Bardet, most of the men in the Tour were looking to improve their overall positions, and were willing to take risks to make it happen. Bauke Mollema (Trek-Segafredo) had gone off the road into the woods on the Col de Domancy, then taking even more risks to get back on, he crashed again. 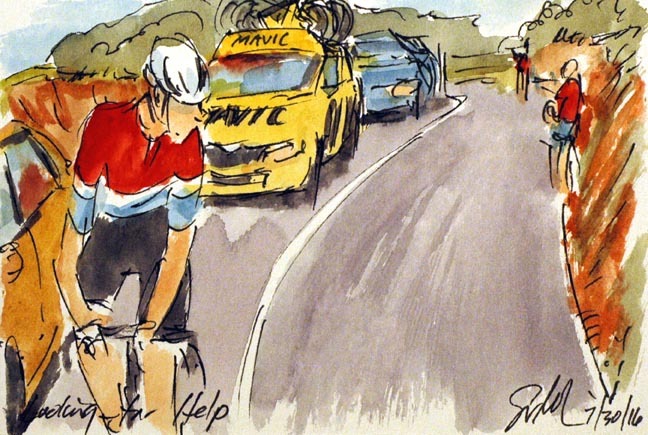 The twin crashes meant that his second place was now up for grabs and Bardet was hoping to make it his. Rui Costa (Lampre-Merida) had been with Pierre Rolland (Cannondale-Drapac) but when the Frenchman crashed on a wet corner, the former World Champion had to simply press on with his attack. Costa won the World Championships in a driving rain storm, so this is certainly not his first time racing in the rain. As Costa descended the Col de Domancy (the climb that had greeted those competing in the Individual Time Trial the day before), he must have been aware of the crashes that were happening all over the road behind. Costa look sure to make it to the base of the final climb alone. The question is, will he still be alone at the top? Trust the Italian team, Lampre-Merida, to have the most colorful kit in the peloton. It certainly is my favorite. With the rain starting to fall on the Tour again, the roads were going to be very slick. The arrival of the rain couldn't have been more poorly timed. Just as the leaders started down the back side of the Montee de Bisanne the rains turned the newly surfaced sections of road way into what felt like an ice rink. Rui Costa (Lampre-Merida) went first and then was joined by Pierre Rolland (Cannondale-Drapac). Rolland had a hard crash early in the Tour. He was just coming back into form in the last two days. So it was particularly sad to see him lose both wheels on a sharp corner on the descent. After hitting the road hard, he slid about twenty feet across the asphalt and then into the gravel and dirt on the side of the road. A photographer jumped out of the way and then checked on the leader of Cannondale-Drapac, before backing away to get the shot. Fans quickly came to their countryman's aide. Rolland got up, got back on his bike and road on towards the final climb of the day. 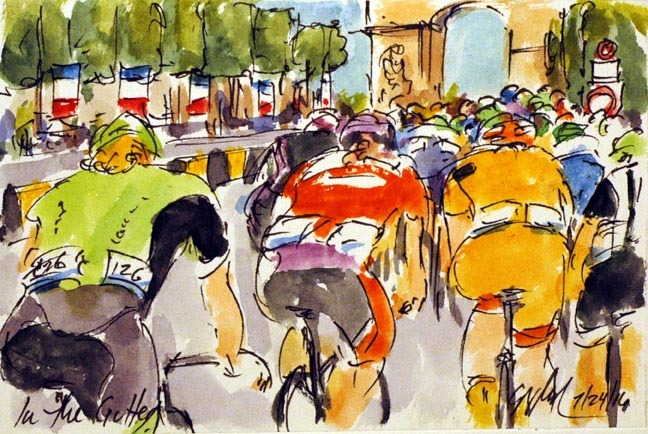 I should note that he finished the stage and as of this evening, he is still in the Tour. If a racer does not finish a stage, they can not start the next day. Their Tour is over. So these hard men on two wheels are very reluctant to not get up and going again. Tour, Stage 19: This Jersey Is His! 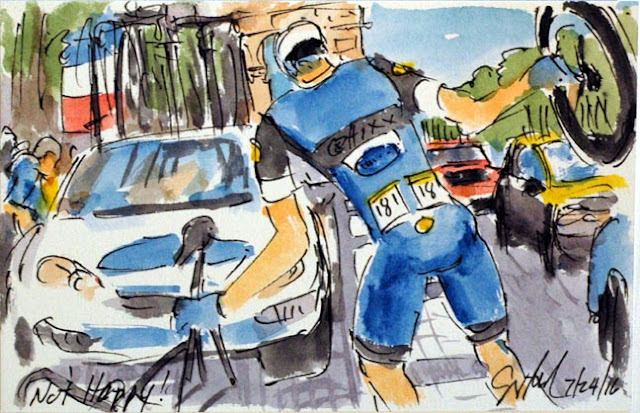 Tour, Stage 15: Where Are the Chasers? Tour, Stage 15: "Did We Drop Them?" 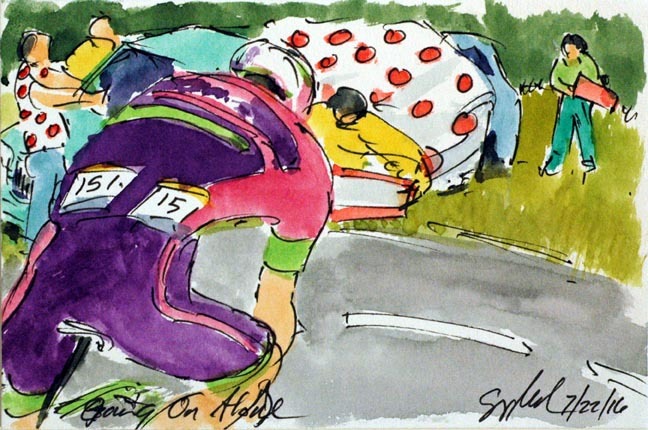 Tour, Stage 14: His Fourth! 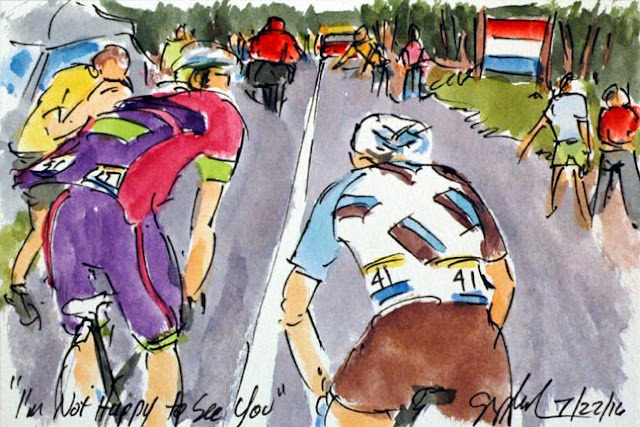 Tour, Stage 14: "You Know They're Here?" Tour, Stage 12: Get Away from Me!